Gary George is a shamanic healer who uses traditional drums and rattles to create profound change in the energy fields of the human body. His healing gifts began to arrive spontaneously when he was in his early forties, and they have been intensifying at a rapid rate ever since. He is of Métis descent, and the First Nations connection is central to his work as he draws on the assistance of his ancestors and numerous helping spirits to dispel negative energy and achieve optimal balance in his clients. Gary is equally at home doing group healings or one-on-one treatments. Although he began his work using hands-on techniques, he rapidly evolved to a place where physical contact was no longer necessary. Consequently, he is also quite adept at delivering distance healing as well. While the energy shifts that occur during Gary’s sessions can be quite dramatic, his playful nature and warm humour before and after create a relaxed atmosphere, allowing people to receive optimal benefit from his work. 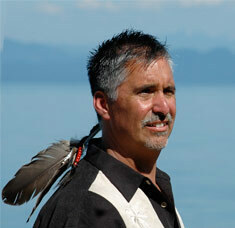 He makes his home by the ocean in Qualicum Bay on Vancouver Island, British Columbia.